Publication Information: Simon & Schuster. 2014. 384 pages. Favorite Quote: "This process isn't all sunshine but it does come with integrity and energy, tenderness and insight, hope and healing. Each of our paths is our own, but all journeys require certain powers of body and soul in order for us to make the most of the trip. These universal virtues help us to show up for our deepest life." The four virtues of the book are presence, heart, wisdom, and creation. Presence is the "opening of consciousness to perceive beauty." Heart is "the opening for a life informed by compassion and passion." Wisdom is "the ability to see beyond what is given into new possibility." Creation is "how we bring ourselves authentically into the world both through our doing and being." In other words, this is book about a philosophy of life - not based on any dogma or rather on certain guiding principles. The book is very consistently organized. The book is divided into four parts, each focused on one virtue. Each part is further divided into five chapters. The first presents the idea behind the virtue, culling stories and examples from literature, history, science, philosophy, various belief traditions, and individual accounts. 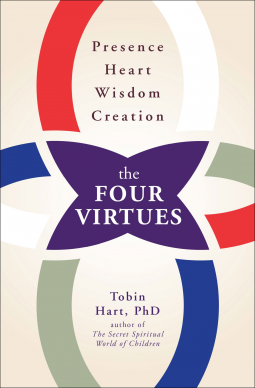 The remaining four chapters of each part discuss aspects of developing that virtue. Each chapter has an explanation of the skill, followed by a quiz to assess where you stand right now, and then a list of practices to help develop that skill. The ideas in this book are not new; however, they are well organized and well presented. The examples are varied and not based on any one ideology. The quizzes are quick and fun and can be insightful. The practices are discrete and concrete. Thus, the book brings structure and intent to what are broad based principles. I can see keeping this book on my shelf and referring to it periodically when I need to center myself. I can also see giving it to certain friend who enjoy this type of spiritual analysis and reading. A positive new addition to self-help genre.